It's New Jersey Sen. Robert Menendez, a Democrat. 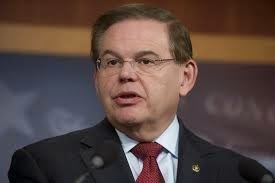 Washington (CNN) The Justice Department is preparing to bring criminal corruption charges against New Jersey Sen. Robert Menendez, a Democrat, alleging he used his Senate office to push the business interests of a Democratic donor and friend in exchange for gifts. People briefed on the case say Attorney General Eric Holder has signed off on prosecutors' request to proceed with charges, CNN has learned exclusively. An announcement could come within weeks. Prosecutors are under pressure in part because of the statute of limitation on some of the allegations. The case could pose a high-profile test of the Justice Department's ability to prosecute sitting lawmakers, having already spawned a legal battle over whether key evidence the government has gathered is protected by the Constitution's Speech and Debate clause.